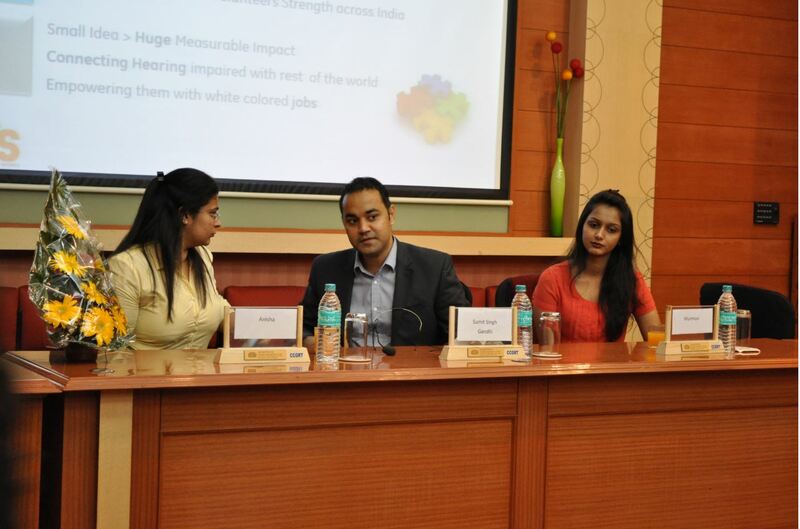 IIM Indore Mumbai campus students interacted with Mr Sumit Singh Gandhi on Saturday, 12 Oct 2013. Mr Sumit Singh Gandhi, Program manager at GE Oil and Gas, addressed the participants on social entrepreneurship and managerial skills. The students sought insights on a sustainable model of social entrepreneurship and how it can be replicated to bring a change in the society. Gandhi holds a Post graduate diploma in management from SP Jain institute of Management and Research and an has done an executive programme in social entrepreneurship from Harvard business school. Early this year, he initiated ‘Sounds Of Silence’ (SOS) in Mumbai – an NGO to give a life to hearing impaired kids. The vision of SOS is simple – to give voice to the mute and to provide the sound to the deaf. Q1) Networking – one of the biggest weapons today’s managers have, what is your take on it? 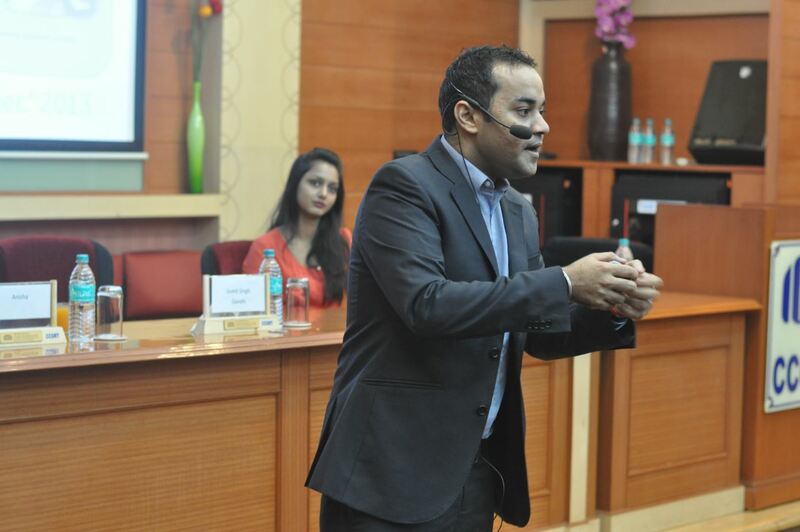 Ans: Rome was not built in a day, so is networking. It develops over a period of time. One should build his/ her network before it is needed. A good network helps a person to get information which s/he might require to progress ahead. It is “a mammoth which one feeds, continuously”. Q2) How did you manage to form an effective team for your social entrepreneurship venture? Ans: We believe in 33.33 percentage principle for people working in a team. According to this, each team has three kinds of people- the first: who only work for the incentive(s), second: who want to work but don’t have time, and third: who work genuinely and put society over self. Social entrepreneurship is not just about either being altruistic or donating money to the needy, but it is a form of giving back to the society to make a difference. Hence this 33.33 percentage principle seems to be meaningful. It is very important to choose like-minded partners for social initiatives to transform the thought into a successful model. Our team is a mix of people who fall in the third category. That has made all the difference for each one of us associated with Sounds of Silence. Q3) In a year, you have 90 dedicated volunteers working beside you for the cause undertaken. How do you keep them motivated with the intent? Ans: To keep your team motivated, you have to LISTEN: listen to them, make them come up with new ideas and then let them execute these ideas. In case they falter, stand up for them. This is how a team learns from experience. The motto to work should be Carpe Diem – seize the day. Start a task, use 24 hours of your day efficiently, and finish it by day end. This is what I have always followed and improved upon. Q4) How can a team be sure of sustaining the pressure and challenges it faces while working on an assignment? Ans: A task or an assignment can be sustainable when the team or the individual who works on it, has the passion, vision and a long time horizon for it. The team should have a participative culture, where impacts are measured from time-to-time and the model under which it operates is replicable. Citing example of my own social venture on how I look forward to create an international impact while going forward in the same direction, proves this. Q5) What is your message to the budding managers and to others who look forward to being social entrepreneurs? Ans: The essential qualities a leader possesses are being innovative, resourceful, and accountable for himself and his team, being opportunity oriented and the most important, always driven by a mission. I mentor students to be different and not to be risk averse, either you will be happy if you succeed or learn something great if you fail in your attempts, and hence one can feel the joy of this short life. I urge IIM Indore Mumbai PGP students to fulfill their high aspirations first and then truly do their bit for the society.